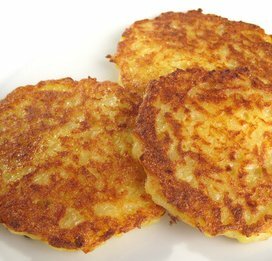 German Kartoffelpuffer (Reibekuchen, Reiberdatschi) are home-made potato pancakes served either as a side to a garden salad or alone with applesauce or berry jam on the side. They are light in texture. Try them as an alternative new side to your favorite salad on a meat-less day, you won't be disappointed. Peal and rinse the potatoes. Grate the potatoes using a box grater or a food processor with a grating attachment. Let potatoes drain in a sieve if they contain a lot of water. 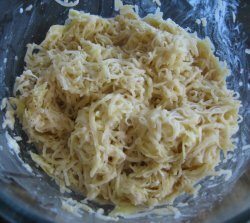 Transfer grated potatoes into a bowl and mix the sour cream into the potatoes immediately, this prevents the potatoes from browning (oxidation), add the egg, flour (or grits), salt and grated onion (optional). Mix everything well until all is combined. Potato mixture can be drained at this point again if it has too much liquid. Preheat a non-stick skillet with the oil on medium-high. Reduce to medium-low and add the mixture into the hot oil (10 cm or 2-3 inches in diameter) and press flat with a spatula. Fry until golden on the bottom then flip and finish the other side until golden as well. Let pancakes drain on a plate with paper towels. Serve with a garden salad or alone with some apple sauce or berry jam on the side.